J&A provided land surveying and civil engineering design services for a 2.5 acre commercial site to accommodate the construction of 2 hotels, requiring separate site plans for each hotel. Project elements included: boundary and topographic survey, site analysis/preliminary design, construction plans and specifications, approval assistance, and construction engineering and inspection. 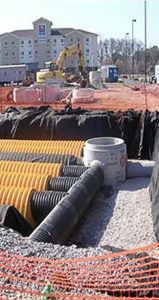 Due to space constraints, underground stormwater detention facilities were required to meet stormwater management goals. J&A provided land surveying and civil engineering design services for a 1.5 acre commercial site to accommodate the construction of a hotel. Project elements included: boundary and topographic survey, site analysis/preliminary design, construction plans and specifications, approval assistance, and construction engineering and inspection.